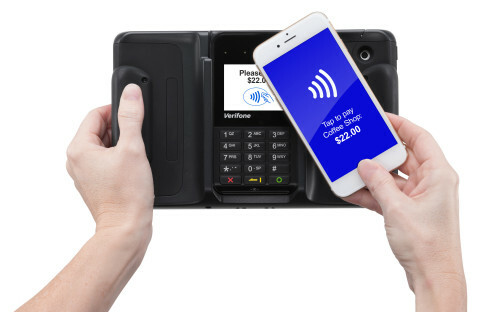 NEW YORK--(BUSINESS WIRE)--(NRF Big Show 2015, Booth #3731) – Verifone (NYSE: PAY) today announced a new device and operating system (OS)- independent mobile point of sale (mPOS) payment terminal that gives larger retailers more flexibility and choice in how they deploy mobile throughout their stores. Deploying smartphones and tablets as mobile points of sale often requires integration with a mobile payment terminal in order to add the security, durability and functionality that merchants need. However, as new generations of smart devices are released, the form factors and other aspects of the devices frequently change. This often requires merchants to upgrade both their consumer technology and mPOS terminal. Additionally, the market for integrated mPOS terminals has generally focused on a single OS, limiting options for merchants who want more flexibility and better integration into their back end systems. The PAYware Mobile e355, the newest mPOS terminal in the Verifone Mobile suite of products, frees merchants from consumer technology upgrade cycles and adapts to multiple OS options. It is a flexible, long-lasting device that can accommodate different form factors and outlive smartphone and tablet models. This enables merchants to make long-term investments in mPOS, at a much lower cost of ownership. Furthermore, it supports all of the major OS options, including Android, iOS and Windows. The PAYware Mobile e355 will be available in late summer 2015. This new mPOS terminal will also support Verifone’s Secure Commerce Architecture (SCA) solution, which eliminates the flow of consumer payment data into the merchant’s integrated point of sale (IPOS) system, and enables encrypted delivery of this data from the POS terminal directly to the merchant’s processor. SCA removes the IPOS from the scope of EMV certification, greatly reducing the burden for clients; and eliminates the potential for this data to be stolen at scale. The Verifone Mobile suite of solutions includes a full line of mPOS terminals, software and services that enables merchants of all sizes to conduct commerce from anywhere. To learn more, visit us at booth #3731. This press release includes certain forward-looking statements within the meaning of the Private Securities Litigation Reform Act of 1995. These statements are based on management's current expectations or beliefs and on currently available competitive, financial and economic data and are subject to uncertainty and changes in circumstances. Actual results may vary materially from those expressed or implied by the forward-looking statements herein due to changes in economic, business, competitive, technological and/or regulatory factors, and other risks and uncertainties affecting the operation of the business of VeriFone Systems, Inc., including many factors beyond our control. These risks and uncertainties include, but are not limited to, those associated with: successful rollout of our mPOS payment terminal solution, market acceptance of our product and services offerings, execution of our strategic plan and business initiatives and whether the expected benefits of our plan and initiatives are achieved, short product cycles and rapidly changing technologies, our ability to maintain competitive leadership position with respect to our payment solution offerings, our assumptions, judgments and estimates regarding the impact on our business of the continued uncertainty in the global economic environment and financial markets, our ability to successfully integrate acquired businesses into our business and operations, our ability to protect against fraud, the status of our relationship with and condition of third parties such as our contract manufacturers, distributors and key suppliers upon whom we rely in the conduct of our business, our dependence on a limited number of customers, the conduct of our business and operations internationally, our ability to effectively hedge our exposure to foreign currency exchange rate fluctuations, and our dependence on a limited number of key employees. For a further list and description of the risks and uncertainties affecting the operations of our business, see our filings with the Securities and Exchange Commission, including our annual report on Form 10-K and our quarterly reports on Form 10-Q. The forward-looking statements speak only as of the date such statements are made. Verifone is under no obligation to, and expressly disclaims any obligation to, update or alter its forward-looking statements, whether as a result of new information, future events, changes in assumptions or otherwise. Verifone mPOS terminal helps retailers more cost-effectively meet the rapidly evolving needs of an increasingly mobile retail environment.